It’s definitely the end of an era here at e.d.s as we wave a very fond farewell to a much-loved driver, who’s retiring after being in the delivery business since he was 17! Geoff Elson started his career as a Walsall milkman, before moving on to become a delivery driver for a number of local companies. He took up his position with e.d.s. 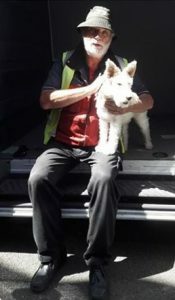 Couriers in the early 2000s, and has become a familiar face, both in the depot and with his regular customers in Walsall and Wolverhampton who looked forward to the smiling face and witty banter that was always delivered alongside their parcels. Matt Evans, our current managing director at e.d.s, said: “Geoff is a real character and has been a fantastic ambassador for our company. Throughout his years on the road Geoff has contributed to Walsall town’s growth, delivering materials for the building of the new Walsall College and Asda, and helping stock Tesco in preparation for its opening. He was also well-known at Walsall Manor Hospital, one of his regular drop-offs, which he has seen through every stage of its rebuild and delivered the filters for its new boiler room amongst other things. “During my time as a delivery driver I have seen lots of changes in my local delivery area of Walsall,” said Geoff. “It’s not just about driving, I got to engage with and get to know a lot of people. “I always tried my best to provide a good service to customers, with a regular schedule and consistency with delivery and collections. If you can’t do this as a driver, you’re in the wrong job. “I’ve loved the job, and particularly being a part of e.d.s., which has grown from a very little to a very big company in the time I’ve been there. So has APC Overnight, who they work in partnership with. 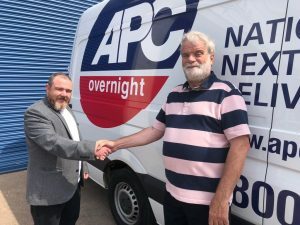 I would describe APC Overnight as one of the leading companies on the market, everyone I speak to is aware of who APC are. Matt added: “It’s true when we say all employees at e.d.s couriers become our extended family – and we’re proud to say we have many members of staff who have been part of our family for a long time. We hope that says a lot about us as an employer.